Prototype: Privately owned tank car used on the Royal Bavarian State Railways (K.Bay.Sts.B.). 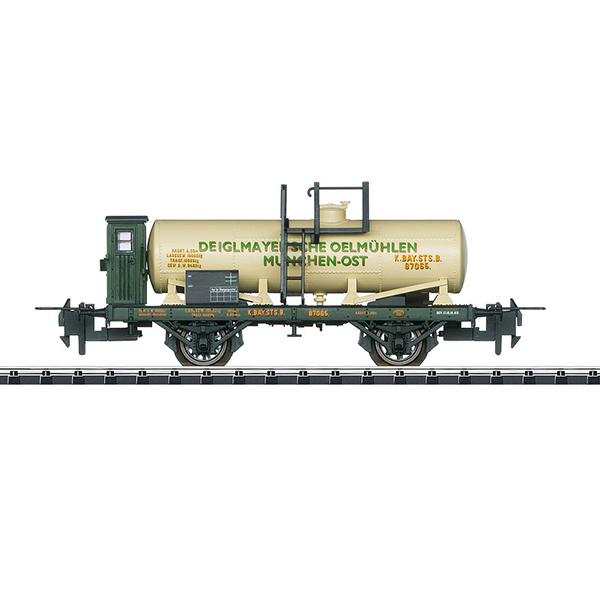 Version as a tank car painted and lettered for "Deiglmayer´sche Oelmühlen München-Ost". Model: The car is authentically painted and lettered for Era I. The frame and body are finely constructed. The car has spoked wheels. It also has an NEM coupler pocket and a close coupler mechanism. Length over the buffers 10.4 cm / 4-1/8". Special car for anniversary celebrants. Only for members with 15 continuous years of membership in the Trix Club. 34 3012 11 Märklin AC wheel set (oxidized spokes, conductive). 34 3826 04 Märklin AC wheel set (gray spokes, non-conductive). 36 6692 00 Trix DC wheel set.